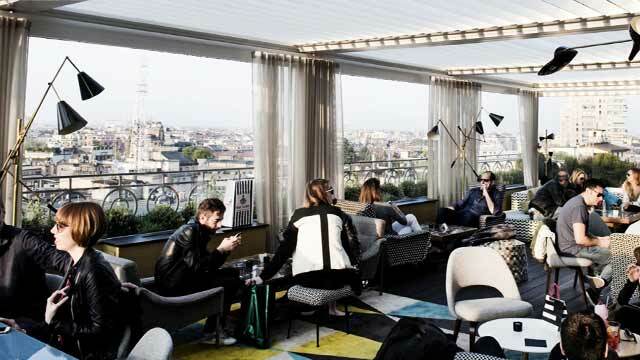 A complete guide to the 9 best rooftop bars in Milan in 2019. Check out the best rooftops in Milan with complete information. Opening hours, dress code, pics, location and much more. 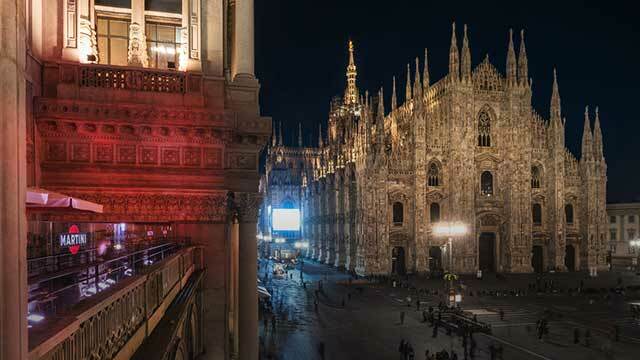 Fashion, food and football – three F that describes Milan in a perfect way. Which are the best rooftops in Milan? 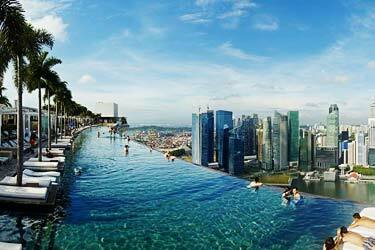 The city has some fantastic rooftop bars where food and drinks are in focus. Many perfect for a romantic dinner and some better for a party. 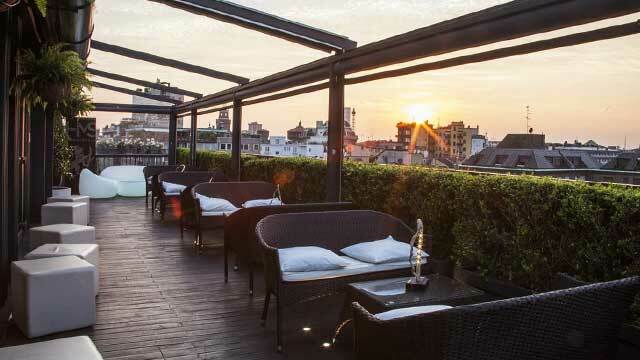 Scroll down and find the Milan rooftop bar best suited for you. Or use the Milan rooftop map in the bottom right corner. 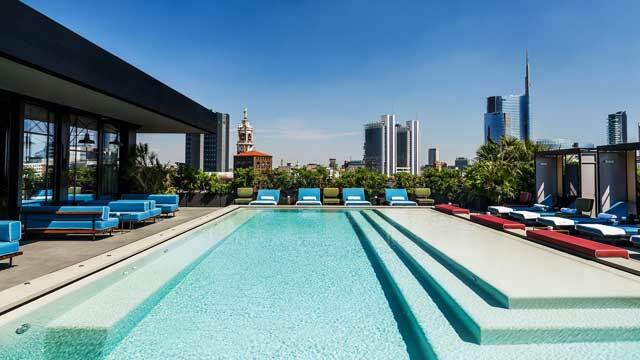 A stunning and luxurious rooftop bar in Milan, equipped with two rooftop swimming pools, comfortable lounge chairs and cabanas and an inside fine-dining restaurant. Located in the Garibaldi district, the roof terrace gives you a fantastic 360-degree view of Milan's skyline and suroundings. Beautiful and modern in decoration, the rooftop bar offers fine mixology cocktails, and the rooftop restaurant serves great Italian classics for both lunch and dinner. Expect top-noth service and a trendy crowd. A very cosy rooftop bar located on top of the Hotel Milano Scala. Lush and green in decor, with inviting and comfy sofas to settle in, the terrace offers great 360-degree views over Milan in all directions. Open during the spring and summer season, Sky Terrace serves a healthy and delicious set of Mediterranean-inspired bar bites and well-crafted cocktails, perfect for pre-dinner cocktails or some romantic apertifs at sunset. The 10th floor summer rooftop bar and terrace of the Ristorante Arya, where you get one of the very best views in Milan. A magical panoramic as far as the eye can see. Located in piazza Giuseppe Missori, in the very heart of the city, La Terrazza dei Cavalieri is both a rooftop cocktail bar and fine dining restaurant. Visit the bar for an apertif, classic cocktails or just a coffee in the sun, while the restaurant serves classic Italian dishes for both lunch and dinner. A pretty new rooftop bar in Milan, working as both lounge, cocktail bar and restaurant. The indoor, multi-level venue is complemented with a 3rd floor rooftop terrace where you get premium front-row views over the beautiful and historical Duomo and to the square in front of it. 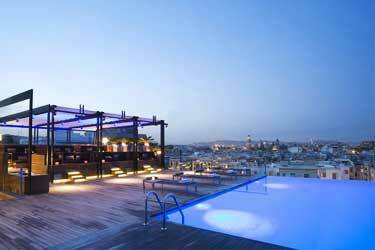 Great rooftop bar for a relaxing lunch or apertif break while exploring the cental parts of town. Towards the night the vibe gets a bit more upbeat after work, sometimes with live DJs. 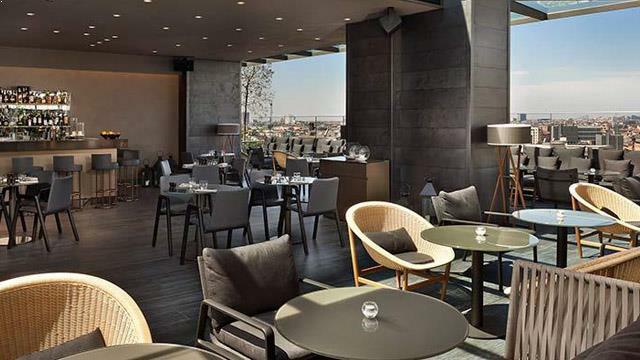 A luxurious rooftop bar in Milan with a great restaurant. With the byline 'Osteria con Vista', this rooftop serves Italian cuisine of the highest class. The rooftop bar is of very high quality to, where you can choose from good wines, signature mixology cocktails and beers. 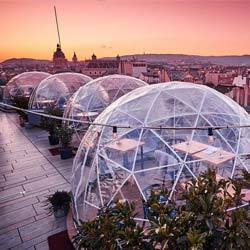 Located in Sempione Park, the rooftop is set partly in a transparent greenhouse, surrounded by an outdoor terrace with lovely views over the park and city skyline and with cosy and romantic ambience. A homely and modern rooftop bar in Milan, located on the 10th floor of The Brian & Barry Building. 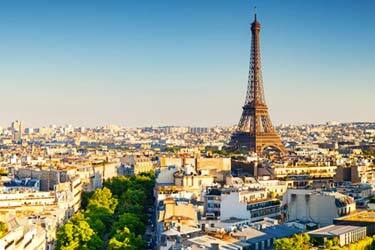 From the roof terrace you get a spectacular. Cool in design, the roof is part greenhouse living room inspired from the 50's, surrounded by a terrace with front-row seats to a spectacular view of the Madonnina and Milan's new skyline. Comfy and relaxed in vibe, here you can enjoy delicious and crafted cocktails made with love and some nice Italian cuisine, both as lunch and as apertivos. 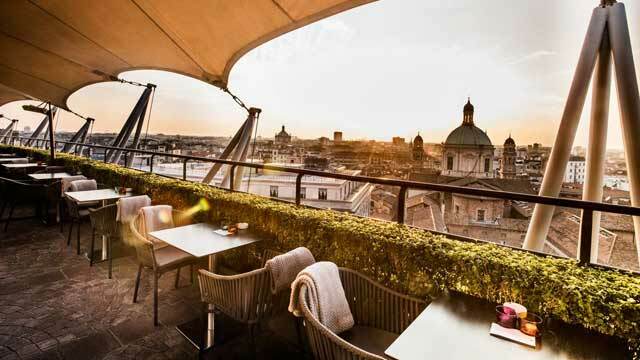 Luxurious and beautiful roof bar in Milan, perched on top of the hotel ME Milan Il Duca. 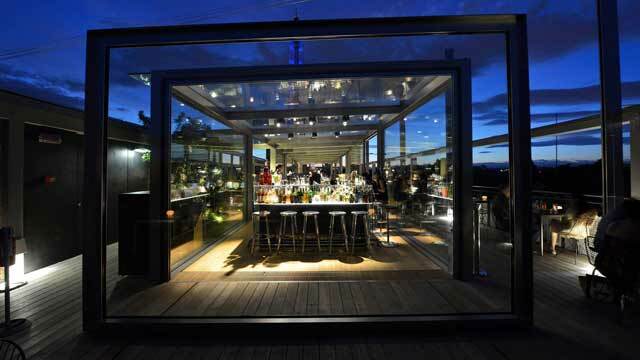 Located in the Piazza della Repubblica, Radio Rooftop brings a slice of New York and London to Milan. Take the express elevator to the 10th floor and you find a view that beats most in the city. Open day-to-night, this elegant and stylish, high-energy cocktail lounge comes with lots of comfy seating both inside and out on the terrace, and offers tapas in all its forms along with creative and well crafted cocktails. 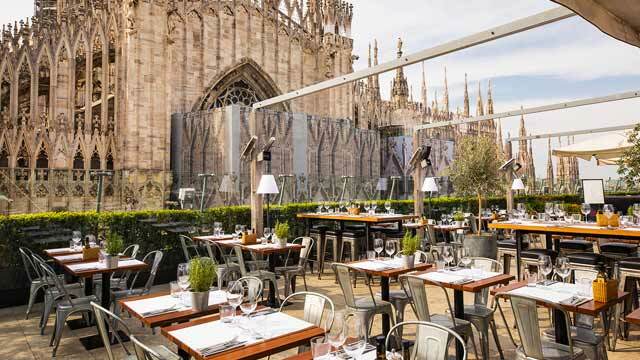 Located just outside the cathedral in central Milan, La Rinascente is a luxurious shopping mall that offers a 7th floor rooftop food court with several different restaurants and bars, some of them with terrace seating and really cool close up views of the Doume. Open from early morning to late nigth, most of the food served is Italian, and it is a great spot for both a sunny lunch break during some shopping in the mall, but also to just stop by for a cocktail, some coffee or a glass of champagn. A restaurant, lounge and rooftop bar, perched on top of the Coin department store, right by Piazza Cinque Giornate. Stylish and chic in decoration and with lovely views over one of the most ancient squares in Milan, Globe offers a bit of different settings depending on when you visit. Come earlier for a more calm and relaxing meal, then as the night wears on the vibe turns more lounge vibrant. Enjoy an ever changing international food menu and crafted mixology cocktails. Discover the biggest collection of Milan activities, guided tours and skip-the-line tickets. Anything you want you'll find right here. 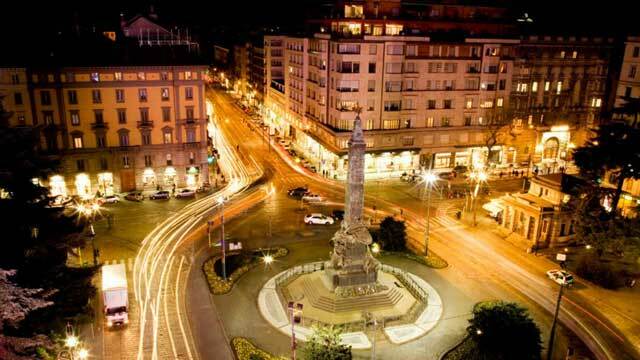 The climate in Milan is warm in the spring, summer and autumn, and a little bit colder in the winter. 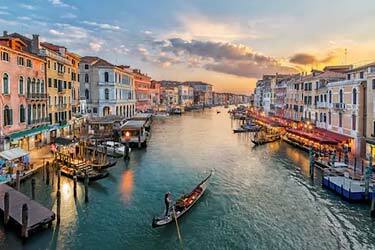 The city is teeming with good restaurants and nightclubs, and the supply of rooftop bars in Milan is big to. 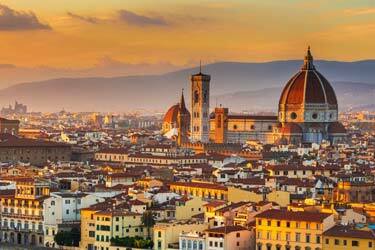 There're also some lovely roof gardens in the city center where you can enjoy good food and wine to the scene of the city's rooftops or the mighty Duomo. 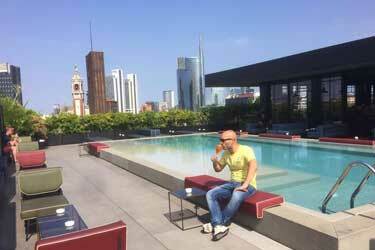 Lots of rooftop bars in Milan are located at restaurants or luxurious hotels. Speaking of hotels, here's a great guide to hotels in Milan. Hopefully this article helped you answering the question of, which is the best rooftop bar in Milan? 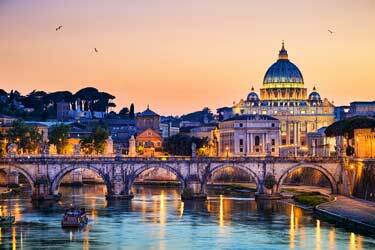 Milan is Italy's second largest city and has one of Europe’s largest metropolitan areas. The city is one of the world's most famous fashion cities and it hosts fashion shows at the highest level several times a year. Here you will also find one of the world's most famous and best opera houses La Scala. Milan also has two of Europe's most prestigious and successful football teams, Milan and Inter Milan, who both play their home matches at the impressive stadium San Siro.